Capture the attention of your loved one with flawless blossoms and undeniable charm. 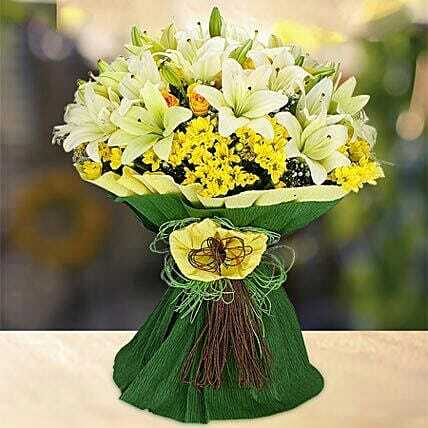 Blushing with beauty, this flower bouquet brings together yellow roses, daisies and Asiatic lilies. Send flowers with floral finesse thats hard to forget. Buy it today for your loved ones to make the moment truly memorable. The beauty of this flower bouquet will light up their life and make them feel happy and joyful. ï¿½Love is like a beautiful flower which I may not touch, but whose fragrance makes the garden a place of delight just the same.ï¿½ Helen Keller Meaning of flowers: Yellow roses sends across a joyful message, lilies symbolize purity and prosperity and daisies symbolize purity and innocence.